Hunting down the ‘BEST Chardonnay in the WORLD’!! It took five months and a journey half way across the world to find it, but my mission is complete – I have tracked down the BEST CHARDONNAY in the world. My extraordinarily patient husband has long endured my obsession with chardonnay. Now, I’m not talking about ‘any old wine’ here – but a beautiful, finely tuned, buttery-oaked, liquid gold piece of perfection. An excellent wine, to me, is nectar from the gods. 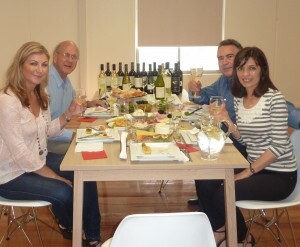 And I abhor Sauvignon Blanc – EWWW, let me spit to the ground right now with contempt. I truly wish I liked beer. Life would be so much easier. But in balance, when I DO find a decent chardonnay, the joy is extreme. I thank the people who picked the grapes, the talented wine-makers who spent years perfecting their craft and the restaurateur who had the good sense to stock the stuff. 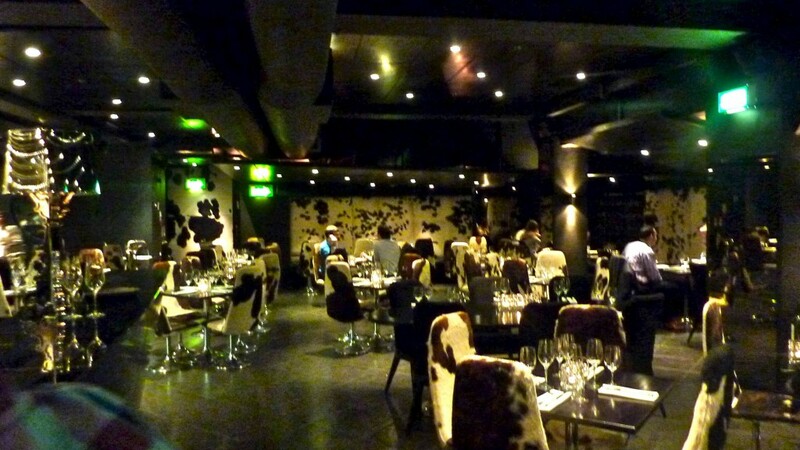 As you can probably guess from the chairs swathed in cowhide, it’s not a venue for vegans. Specialising in Argentinean steaks, guests are invited to choose their own particular cut of meat from a well-presented tray that’s brought to your table. And while I also enjoy a rich glass of red, (and did with my steak), I opted for a chardonnay to have with our entree. One sip and I was hooked. ‘WOW. WOW and WOW!’ I declared to the table, ‘This is the BEST chardonnay in the world!’ Okay, that may have been ‘slightly’ over-stating it, but such is my excitement when I make a NEW chardonnay discovery. So good it was, that I knew I’d want to track it down once I returned to Melbourne, so I asked our waitress to write down the wine’s name and vintage on a business card. 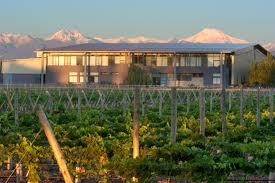 TAPIZ is the name of the winery and it’s located in Mendoza, Argentina. 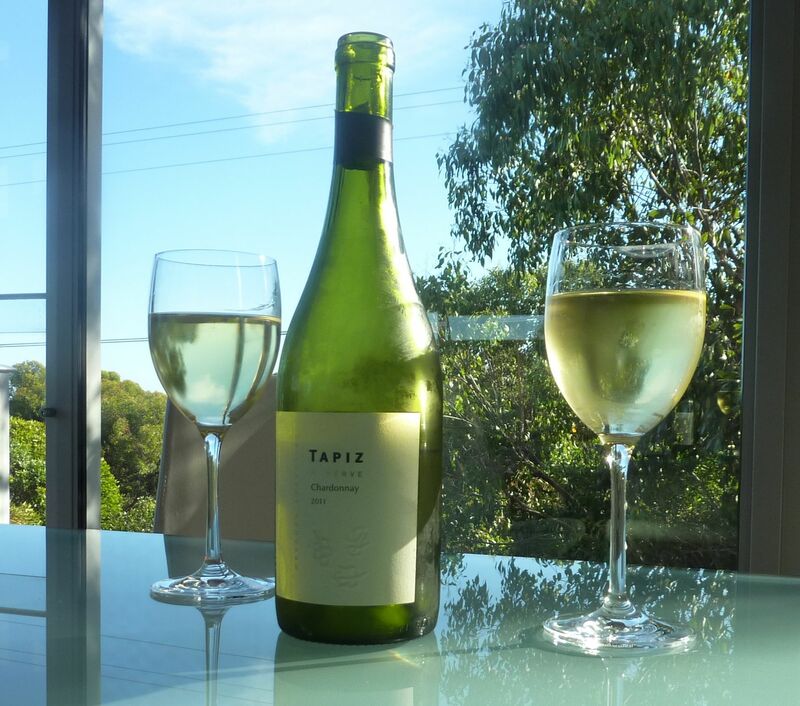 ‘Tapiz’ means ‘tapestry’ in English – appropriate given the fine tapestry of flavours it affords the palate. When we returned home in September, I began the task of tracking Tapiz down in Australia. I tried the obvious first – Dan Murphy, Vintage Cellars and the local bottle shops, with no luck. Then I went on to a few wine websites – again nothing. How could this be? How could a wine so extraordinary not be available to the masses? The only solution seemed to be to contact the winery direct in Argentina. I found the TAPIZ website, but that was of no use whatsoever because it’s all in Spanish. If only I was fluent… Nevertheless, I dashed off an email in the hope that someone in their office might be able to translate and help. 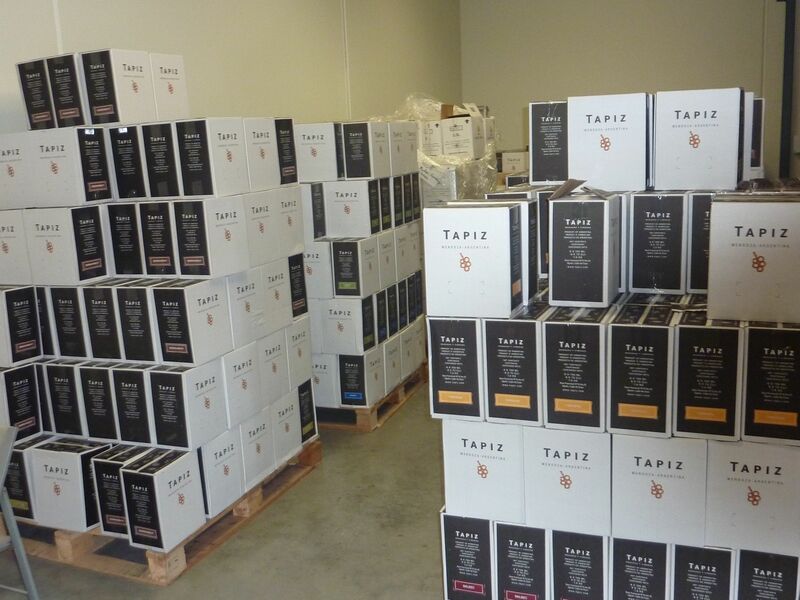 Sure enough, a week later I received a reply explaining that the winery had just made arrangements with an Australian wine importer to bring Tapiz to our shores. In just a couple of months, I could contact RED BARREL Importers of Fine Wines to purchase my much sought after chardonnay. When I learnt Red Barrel had another business – Cosi Duci Gelati in Ivanhoe – I knew we’d get along fine. If I were ever to specialise in food and beverages, I couldn’t think of a better combo than wine and gelati! Owners Victor and Silvia Scalia and I were definitely going to be kindred spirits. Red Barrel also scored a big, fat gold star for such a prompt follow-up after my initial query. Just two weeks after receiving their first shipment of Tapiz, Sylvia arrived on my doorstep from completely the other side of town, to hand deliver two bottles of their finest for me to sample. 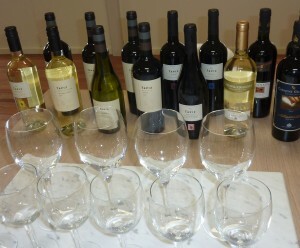 She also invited us to a ‘tasting’ at their premises so we could learn more about the full range of Tapiz wines. It was then, when I held that long-sought-after bottle of wine in my hands that I began to have doubts. Was this wine really going to be as good as I had remembered it all those months ago in London? Perhaps my perception was coloured by the seductive ambience of the lush Gaucho restaurant and the fine food? Maybe this had been one long wild goose chase? Was it going to be as good as I remembered? 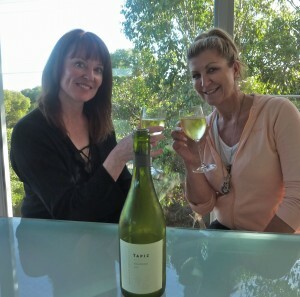 Needing a second opinion and validation, I saved that bottle until I caught up with my fellow-chardy expert and sister-in-law, Penny. Down at their home in Anglesea on a sunny, summer’s afternoon, we finally cracked it open. Kapow! Yes, there it was! That fine, golden liquid delivered on it’s promise. It was indeed worthy of a blog to share its greatness with the world. The second validation came after meeting with Victor and Silvia Scalia at their Red Barrel premises. 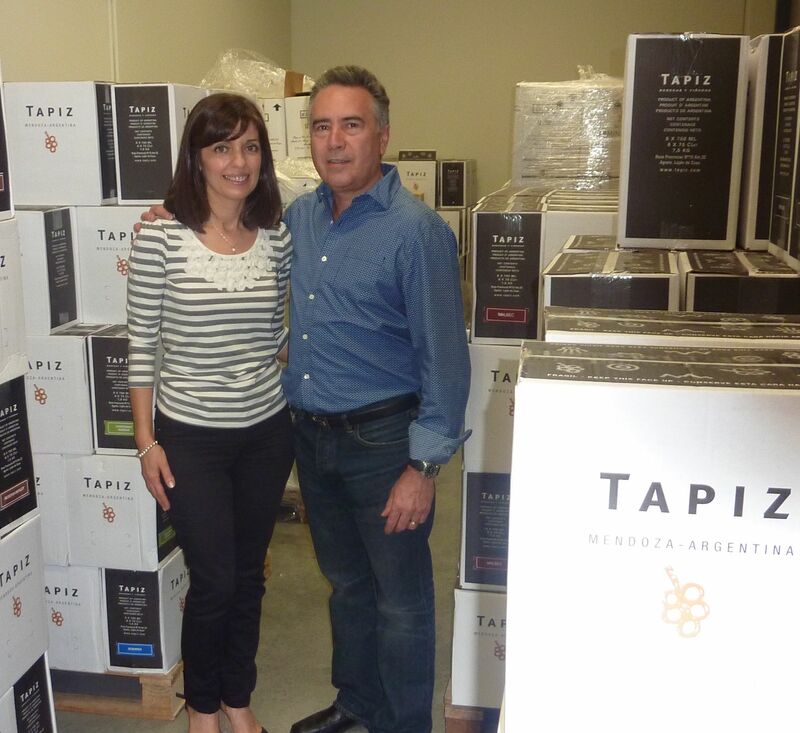 They share a passion for quality wine, which is why they began their importing business in the first place. 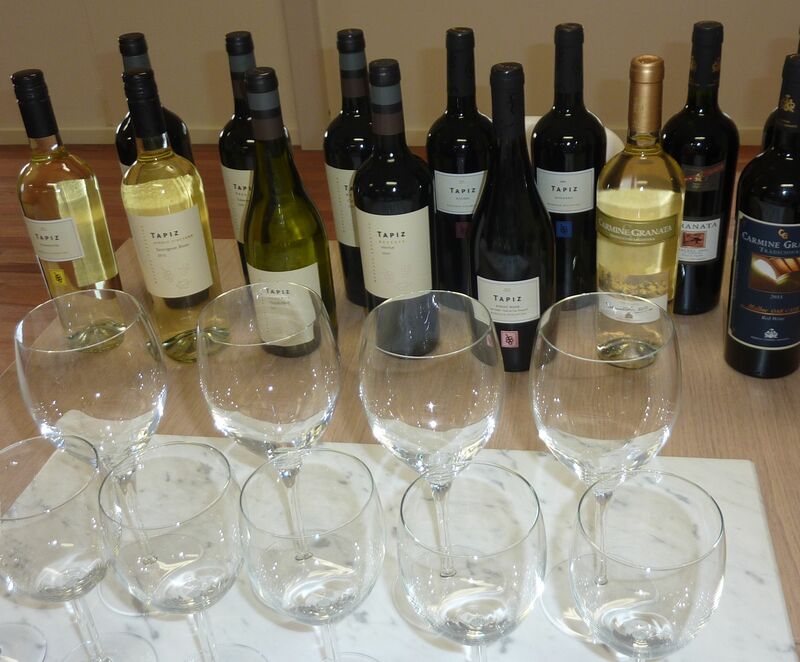 Victor visits Argentina at least once a year and was disappointed he couldn’t find the best of their wines in Australia. The best solution – import it yourself! 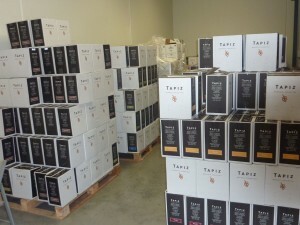 Red Barrel is now the exclusive importers of both Tapiz and Granata wines for Australia. They’ve already made inroads in Melbourne’s restaurants – notably Piqueos in Rathdowne Street, Carlton, Othello at Southbank and a new restaurant called Buenos Aires Steakhouse which is opening soon at 189 Lygon St, Carlton – plus they sell direct to the public. Prices range, depending on amounts and variety, between about $21 wholesale and $27. A fine feast – cheers Tapiz! Fletch had to film Neighbours on the day of the wine tasting at Red Barrel, so I took my Dad along instead. I think I inherited my love of fine wine from him, after all! Sylvia laid on a fine feast and I was again delighted to sample my now-favourite chardonnay. Although Victor and I disagreed on one thing. He’s convinced the Malbec is the best of the Tapiz range. It’s a mighty fine and mellow red, but I’d still opt for the chardonnay.